Most of you know that I mainly use samples and miniatures when preparing my Reviews. At the request of many of my readers I give preference to more recent expressions. As a result, my backlog of older samples has increased quite a bit. To do justice to those samples I will review them in the format of Specials. These specials will deal with a specific distillery like today or with specific bottlers, countries or regions. The reviews in these Specials will concentrate on the Whisky and won't touch too much details about distilleries, maturation etc. I do hope you will like these Specials just as much as my regular reviews and I look forward to your reactions and suggestions. In this special I will review three random Highland Park Single Malts. Enjoy! Buying Advice: 😀Good P/Q ratio. 😏Too Thin. Deserves 43%. Relatively Young, Light and a little Sharp. A hint of Sulphur but nothing serious. The Alcohol is noticeable and so are the Refill casks. A rather clean nose with some Sweet, Salty, Floral and Mineral notes. Smoke and Peat remain quietly in the background. Not bad but on the Light side. Toasted Cereals, lightly Buttered Toast, Vanilla, Dried Fruit like Raisins, Figs and Apricots, Heather-Honey, Grass, Orange, Oak, Cinnamon and Cloves. Wet Rocks, Salted Toffee, Green Apple, Toasted Pineapple, Yeast, Smoke, Pine Needles, Banana Flavoured Yogurt, Lemon, Varnish and Leather. The too low ABV causes a Thin and almost Watery delivery. That's a pity as the Flavours are not bad. The American release at 43% should be much better in this respect. On the Palate, Viking Honour presents Sweet, Dusty, Grassy and Spicy notes. A light Oaky Bitterness as well. Toasted Cereals and Nuts, Salted Caramel, Vanilla, Butterscotch, Orange, Cocoa Powder, Dried Fruit like Raisins and Apricot, Grass/Straw, Pepper, Cinnamon, Ginger, (Peat) Smoke and Ashes and Dairy. Brown Sugar, Toast, Heather-Honey, Lemon, Green Apple, Dusty Track, Herbal Tea, Cloves, Licorice and Varnish. Middle Long. Sweet at First but with increasing Spice and Bitter Oak towards the Medium-Dry end. I find Toasted Cereals, Salty Caramel, Vanilla, Nuts/Nutshells, Grass, Straw, Heather-Honey, Orange, Lemon, light (Peat) Smoke and Ashes, Pepper, Ginger, Cinnamon, Cloves, Licorice and Cocoa Powder. Would be better at 43/46%. No need to add Water to the Viking Honour. Good given its Price. Too Thin for me personally to consider it as a to-go-to daily Malt. Like in the States, the Viking Honour should be bottled at 43%. As I had a full bottle, I tried a little over Ice as well. It was okay but nothing more. Better sip it neat without added Water. 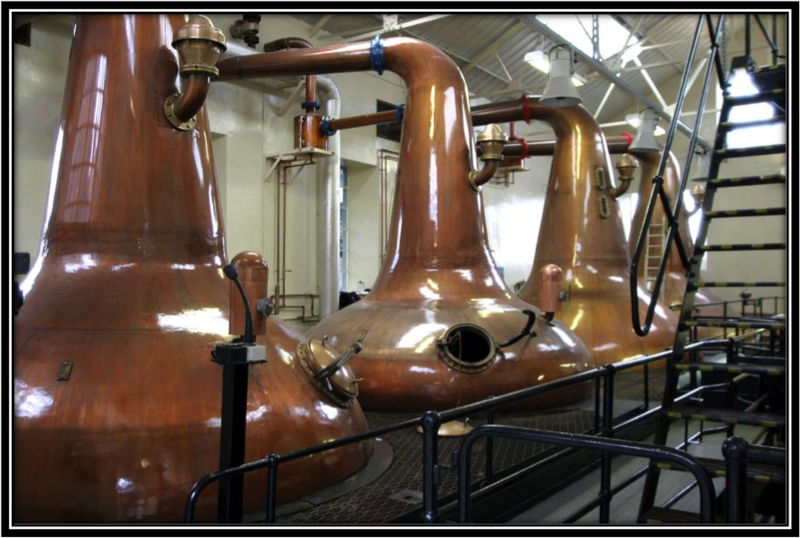 The distillery was founded in 1798 by David Robertson. It is located in the small town of Kirkwall on the isle of Orkney. Orkney is still quite strongly influenced by its Viking past and the distillery has increasingly used this past as a rather successful marketing tool. 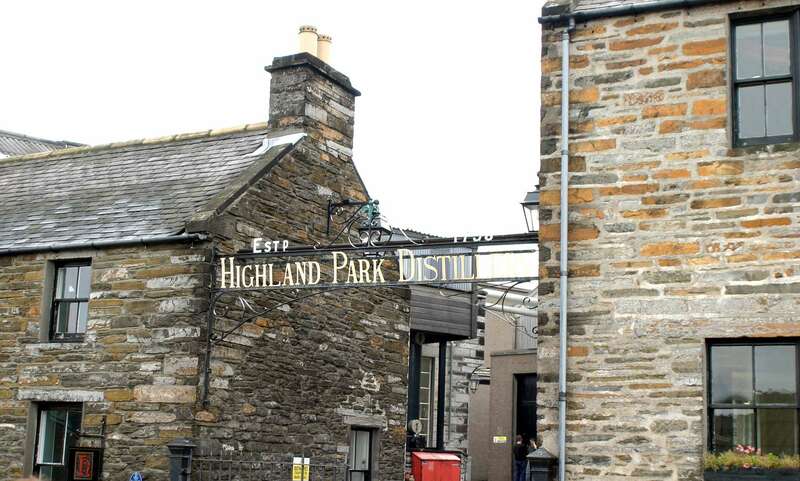 Highland Park currently produces around 2.3 million litres of Alcohol and is owned since 1997 by the Edrington Group. The core range consists of the 10 (Viking Scars), the 12 (Viking Honour), the 18 (Viking Pride), the 25, 30 and 40 years. We are planning to visit the distillery in 2019. In 2017 the popular 12 Years received a beautiful new bottle. To honour their ancestors, the distillery also added the title Viking Honour to the 12 Years. It is said that the recipe basically remained the same although the Viking Honour is showing a slightly lighter colour. The USA version is bottled at 43% or 86 Proof. It must be said that the Viking Colour is very pleasantly priced when compared to a lot of its peers. I have scored this Viking Colour quite similar to the 12 Years. I didn't find any significant changes compared to recent 12 Year bottlings. 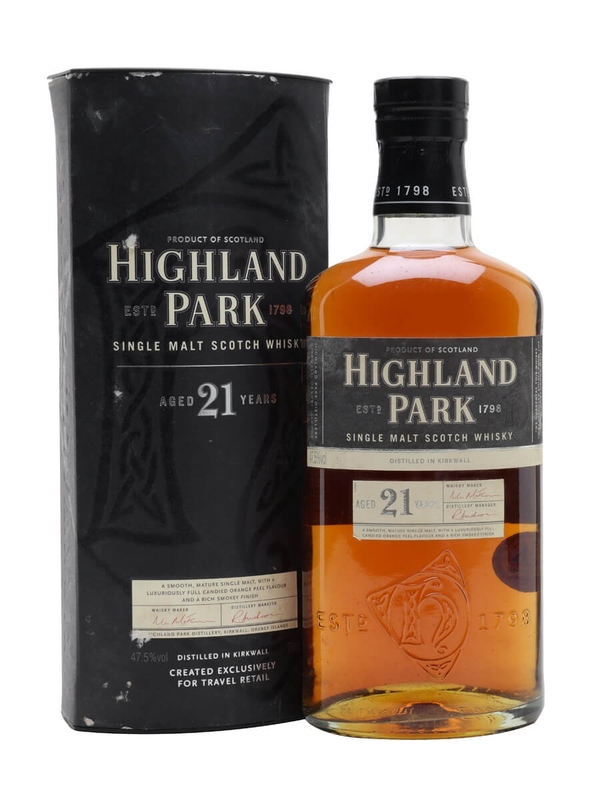 The most positive aspect of this Highland Park is its price. Quite reasonable for what it offers. I do find it too Thin and Watery and personally I would prefer to pay a few bucks more for an ABV of 43%. But if you're into a light & mildly Smoky entrance Malt at an affordable price, the Viking Honour is certainly a valid alternative. 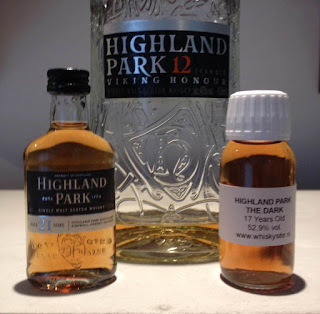 Let's examine some mature Highland Park now! Brand: Highland Park - Bottled Around 2007 - Discontinued. Be sure to give this HP enough time in the glass for the Alcohol to relax. The Oloroso Sherry influence is clear. On the Nose, the HP 21 is Sweet, a bit Dusty, Floral and Fruity. The Peat Smoke lingers nicely in the background. I must admit I expected a little more depth considering the number of years in the casks. It's still quite pleasant though and reasonably well-balanced. Toasted Barley, Buttered Toast, Vanilla, Treacle, Salted Caramel, Dark Dried Fruit like Sultanas, Plums and Prunes, Orange, Herbal Tea, Walnuts, Marzipan, Dark Chocolate, Tobacco, Nutmeg and Cinnamon. Heather-Honey, Straw, Waxed and Polished Old Leather Upholstery, Old Book Shelves, Dusty Track, Lemon, Charred Oak, Peat/Smoke, Roasted Coffee, Peach, Cherry, Raspberry and Cloves. On the Palate and in the Finish the 21 Years is less Sweet than I expected after Nosing. It's quite Dry and Tannic actually and driven by Wood, Wood Spices and Herbs. It's got a little less complexity than I would expect considering its age. The Peat & Smoke are quite nicely integrated although they are more present here than on the Nose. Some Sour and Bitter notes for balance. Toasted Barley, Salted Caramel, Treacle, Vanilla, Dried Fruit like Dark Raisins, Prunes, Cherry Flavoured Cough Pastilles, Herbal Tea, Charred Oak, Mandarin, Orange, Nuts, Dark Chocolate, Tobacco, Aniseed, Menthol, Ginger, Cinnamon & Nutmeg. Heather-Honey, Dusty Track, Polished and Waxed Leather, Peat/Smoke, Straw, Lemon, Red Apple, Cloves, Pepper and Licorice. Middle-Long. Mainly Bitter-Sweet but with a few Sour notes as well. Quite Dry and Tannic towards the end. Wood, Wood Spices & Herbs start to dominate. I find Toasted Barley, Vanilla, Salted Caramel, Straw, Earthy Peat, Dusty Track, Ashes, Dark Dried Fruit like Sultanas, Plums & Prunes, Orange, Hazelnut, Cigar Box, Mandarin, Cherry, Lemon, Honey, Dark Chocolate, Marzipan, Pepper, Cinnamon, Ginger, Nutmeg, Aniseed, Menthol, Licorice, Tobacco and Leather. I added a few drops of Water and I get more Fruit like Peaches on the Nose. I don't often use the word Smooth for the mouth feel but there it is. The Finish becomes too Short and Thin though. You can carefully add a few drops at a time. The 21 Years was initially released in 2007 for Travel Retail only. 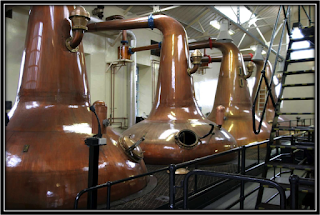 Lack of stocks forced the distillery to bring down the ABV from 47.5 to 40% a few years later. Obviously this was not received well and in 2012 the original ABV was restored. The Travel Retail range was completely renewed this year. 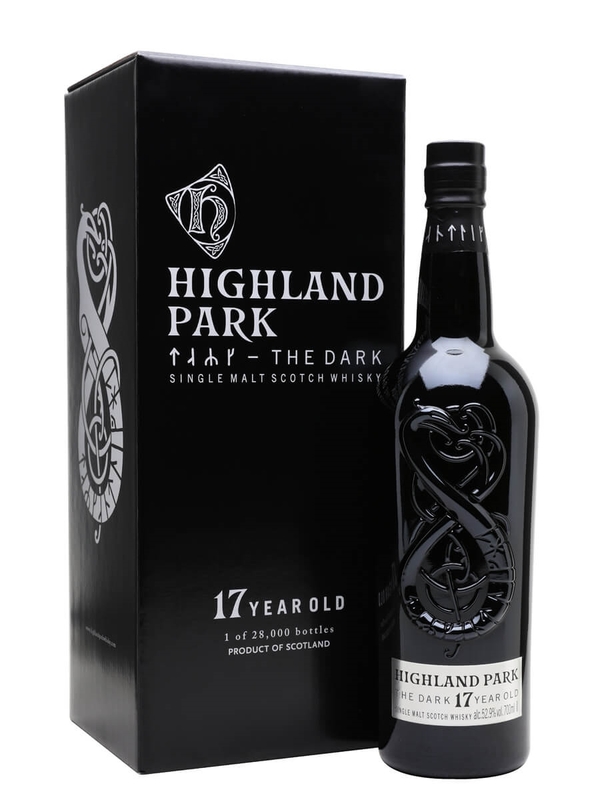 I'm not a huge fan of most of the Legends, Vikings and Dragons that Highland Park releases with remarkable ease. I prefer their core range & the 18 Years and this 21 Years are among my favourites. The 21 Years is a well-made Single Malt albeit it a little on the simple side. I simply expect more of a 21 Years old Whisky. But it's quite pleasant, especially on the Nose. Wood, Spices and Herbs are slightly dominant on the Palate and in the Finish. To sum it all up, I kinda like the 21 Years although it does not present a friendly P/Q ratio. Buying Advice: 😀Good Mainstream Single Malt. 👎Negative P/Q ratio. On account of the high ABV, please give The Dark sufficient time in the glass. The Sherry influence is loud and clear. On the Nose The Dark is mostly Sweet accompanied by Herbal, Dusty, Earthy and lightly Bitter and Sour notes. The HP Peat and Smoke remain quietly in the background. Oak & Alcohol are noticeable. All in all a bit on the Light side and "mainstream" but not unpleasant. Toasted Barley, slightly Burnt Toast, Salted Caramel, Dried Fruit (Raisins, Figs and Apricot), Roasted Almonds, Marzipan, Polished Leather, Yeast, Orange, Cut Wood, White Chocolate, Cinnamon and Licorice. Heather-Honey, Vanilla, Christmas Cake, Blackberry Muffins, Earthy Peat, light Smoke, Nutella, Herbal Tea, Peach, Red Apple, Cloves, Pepper and whiffs of BBQ and Ashes. Bitter-Sweet and Medium-Dry. The Peat and Smoke are more noticeable now. The Palate is Sherry-driven without overdoing it. A nice Fire-Place Malt in The Dark Days before Christmas. Toasted Barley, Salted Toffee, Dark Fruit like Raisins, Prunes and Apricot, Straw and Grass, Dark Berries, Roasted Coffee, Smoke/Peat, Orange, Tobacco, Cut Wood, Cinnamon, Pepper and Mint. Heather-Honey, Vanilla, Nutella, Red Apple, Ashes, Herbal Tea, Leather, Cloves, Nutmeg, Cardamom and Cherry-Flavoured Cough Syrup. Again a hint of BBQ. Middle-Long, Medium-Dry and Bitter-Sweet. A light Metallic Off-Note. I also find Toasted Barley, Vanilla, Salted Caramel, Chocolate, Nutella, Smoke/Peat, Ash, Dried Fruit like Raisins, Plums and Apricot, Red Apple, Pepper, Cinnamon, Mint, Nutmeg, Cloves, Grapefruit, Tobacco, Leather, Espresso and Dried Herbs. The Dark does not improve with added Water despite the high ABV. 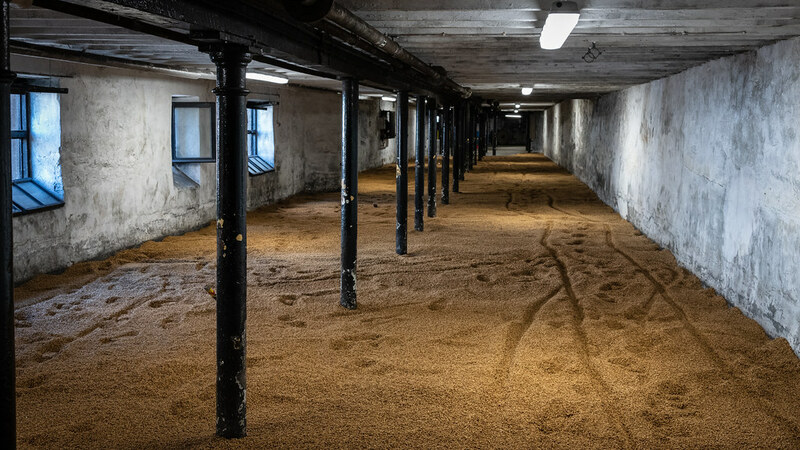 In 2017, Highland Park released two Single malts that celebrate the seasons on the Isle of Orkney. The Dark that I'm reviewing today represents the Autumn and Winter while The Light symbolises Spring and Summer. The Dark is a well-made Single Malt and its Aroma/Flavour profile does remind me of a cold and dark December night. It's a mainstream Malt that won't offend anyone. So far, so good. What's not good at all is the price! I know that a 17 Year old Malt can't be cheap. But to ask around US$ 250 for The Dark is highly exaggerated. Go for the core range 18 years Viking Pride instead! 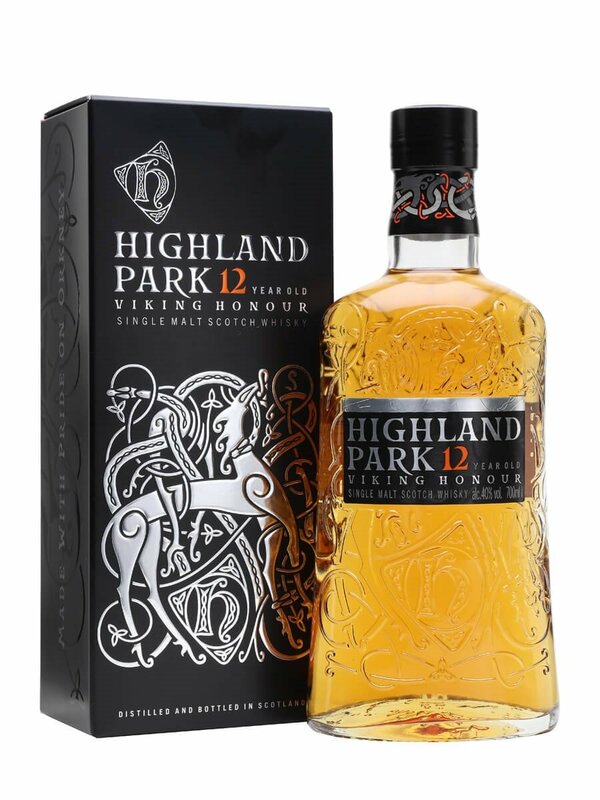 I know that a lot of people are attracted to the Viking strategy of the Highland Park Distillery. Lots of special releases with good stories, old Nordic Heroes and attractive presentation. But in the end you are paying a lot of money for that! Price/Quality wise you are better off with Highland Park's core range. At least in my opinion.